The Twin Flex shell technology offers full-length pressure relief while K:ium rails provide an 8% weight reduction over titanium and provides better vibration absorption. Nice narrow nice, slightly concave contour, firm padding. Let me preface this review by saying that I am a big guy. I weigh about 288 at this writing. The saddle came on my Bianchi Infinito. It was a Delta model. I had expected to replace this saddle almost immediately. But, being on the cheap side I decided I should give it a fair shake before hanging it on the wall of my garage as potential barter down the road. After a few short test rides to get it adjusted the saddle seemed to disappear. (Considering my size, it may very well have disappeared from view at least). I had always had problems with chafing and the narrow nose has alleviated that.. The slight concave contour really seems to fit me too. I have about 2500 miles on it and am still very pleased with it. Cosmetically it still looks brand new. Saddles are very personal items. This saddle may not be for everybody. 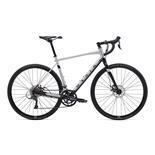 I gave it a 5 star rating for value because it came with the bike. I have gotten pretty use to the idea of automatically replacing the saddle. From my point of view the saddle was free!! - turns you into a advertising poster any time you step off the bike - but instead of paying you, they charge you for it! 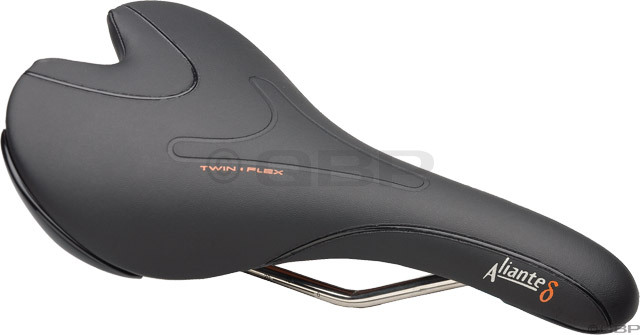 - the Fizik Aliante is a saddle designed like a 1980s saddle if not older: too round, too narrow. - being too round at the front it compresses nerves and blood vessels thus rapidly causing numbness in the male reproductive organ. - being too narrow at the back it causes undue pressure on the sit bones. - oh, and Fizik don't even seem to know that pelvis sizes vary - so they offer this saddle (and all their saddles) in just one width! Frankly. Frankly in 2014 and with engineers and specialists in biomechanics having done so much to understand the forces exerted on the body by a saddle, you would have thought that a big brand would have paid attention. But no apparently they spend most of their money on marketing. People like Specialized (w the Toupe) or SQLabs (w the 611 / 612) are much more advanced in this respect. For me, this saddle is a 1. 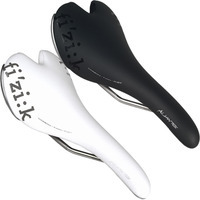 I have tried the other Fizik saddles, without any luck. None fit me. For the Aliante, the shape completely puts pressure on the perennial tissue. I was measured in at about 142mm, so the measurements were supposed to be correct. But my sit bones have to perch on the sides of the saddle, which are lower than the center, upon which the weight of my body, via the soft tissue, bears much of the weight. Numbness has been a serious issue. I have used this saddle for some time, adjusting it, adjusting my posture, to no avail. I have tried numerous saddles, and I am going to test out the Specialized Romin models, which I hear tremendous things about, for people such as myself who are trying to find a saddle that is friendly to the soft tissues down there. This saddle is well-crafted, and apparently works well for many people. Saddles are a highly personal issue; that said, for me, I have determined after ample time trying to give this one a go that it is completely un-usable - a 1. This is a very comfortable saddle. I have the carbon braided rails version and it soaks up the vibrations on the road like you wouldn't believe. I am used to it now, but when i changed from my San Marco saddle i was very impressed for days. Excellent material quality and craftsmanship. Interesting design concept. Shape of the seat truly infringes on soft tissue area. Despite all of the raving reviews for the Aliante, my experience wasn't the best, so I figured I'd share it for those looking for a new saddle. The quality and craftsmanship of the saddle is wonderful. The design in theory seems like it would be a great saddle with the carbon mesh, however, for those riders with soft tissue concerns, this is likely not the saddle for you. Not only is there no center cutouts, but where your seat bones would normally hit, the saddle "falls off", or curves downward. This saddle put undo pressure on my soft tissue area more than any other saddle I've ridden (mostly stock Specialized saddles, which i've never had a complaint about). If you require soft tissue relief, look at the Terry Fly. Comfortable from start to finish in long rides. I used have a Selle Italia C2, which was fine for rides < 50 k. But for a recent 9 day trek across Europe from northern Italy to The Netherlands (1350 km) I started doing rides above 100k. For this the C2 is useless. I tried an Arione which was better but not good enough. Finally got a test Aliante and was on it for 9 days without any complaint. None that I can think of. Durability could be an issue, haven't used it long enough to know anything about this. Very comfortable saddle for long rides. Comfort, freedom of movement, looks. 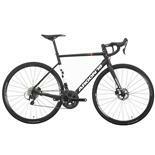 The carbon railed versions are pricey. I own five road bikes, all w/Aliantes. The two of my bikes that are high end both have the braided carbon rails. Two of the bikes have the Aliante K:ium rails and one (always on the trainer) has the Ti rails. I have owned a variety of saddles and have strayed on occasion always to return. I own a couple of Ariones and they are good saddles, but not as good. The Aliante, if fitting your bone placement, is the most comfortable saddle on the market. You feel like you are dropping into a custom made cradle which combines movement, comfort, and looks in the one package. I cannot say enough good about these saddles. I understand that all butts are not the same and therefore respect the views of other riders, but for me there is no other saddle. Most comfortable mass-produced road saddle on the market. The best mass-produced road saddle on the market. The K:ium rail and carbon-rail Aliante versions are the two I would recommend, as they are equally comfortable, just at different weight and price. Both use a wide hammocking area underneath that appears to be aramid weave (yellow) suspended from a carbon outer frame. The budget-minded Gamma version is OK but is noticeably less comfortable, due to a plastic frame and smaller (white) hammocking area. I occasionally have strayed to try other saddles, and always quickly return to the Aliante. 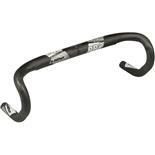 If weight is an issue for you, splurge on the carbon-rail version, which is acceptably lightweight. The integrated clip is extremely useful, allowing you to clip in a Fizik-brand saddle bag without touching the rails. Comfort, looks good in white. 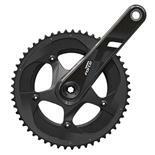 A bit expensive, but worth it in my case as it has transformed my ride experience. The stock saddle that came on my Madone had my arse threatening to leave home. 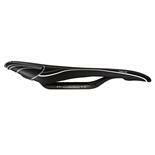 I tried other Bontrager saddles, but still suffered from pain and numbness after about 40 miles. I took the plunge from desperation and it was the best thing I ever did. From the outset, this saddle was a joy to sit on, and my arse loves me again. I have only had it a couple of weeks, but I have tackled a couple of 60 mile + rides that I could not have faces on my old saddle and could easily have kept on going.